INTERCEPTOR CS is CNSSI 7003 Compliant, DISA Risk Management Framework accredited, and is the only system of its kind with a Certificate of Networthiness. INTERCEPTOR CS provides an end-to-end solution that quickly and cost effectively ensures organizations pass CCRIs the first time, every time. 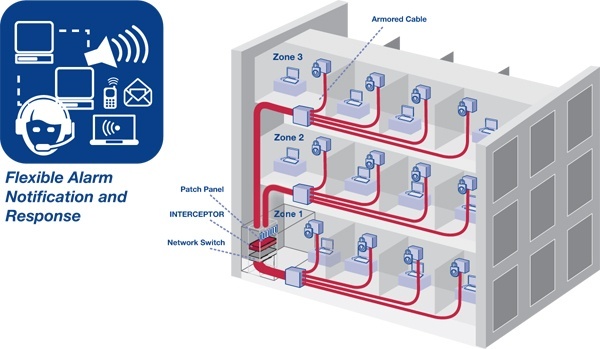 At the heart of the product line is the INTERCEPTOR™ Optical Network Security System. Using patented technologies, INTERCEPTOR ensures the integrity and availability of network data by monitoring spare (unused) strands of fibers within the optical cables of the network infrastructure. This 24/7/365 monitoring allows the system to immediately detect and report even the most subtle tampering or the most sophisticated intrusion attempts. When spare/unused fibers are not available, INTERCEPTOR+Plus can monitor active (data transmitting) fibers. Contact our Sales Engineers to discuss your specific environment, get recommendations on leveraging our products’ interfaces to integrate with your existing systems, or to deploy a custom, scaleable, mission-focused solution. 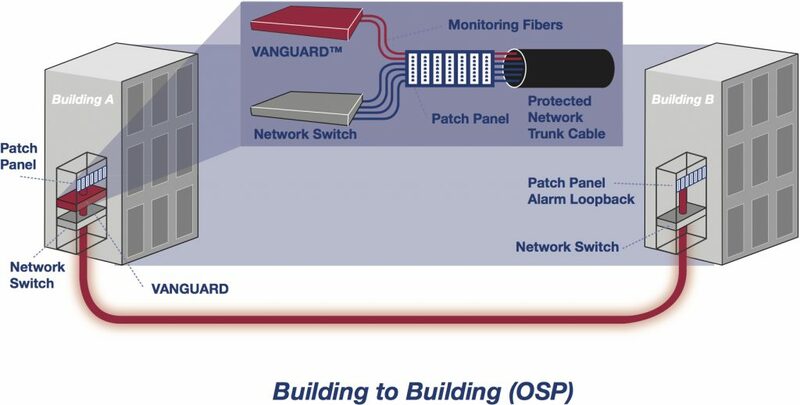 Because INTERCEPTOR monitors the fibers within the cables carrying the classified data (intrinsic monitoring), point-to-multipoint (hub-and-spoke) monitoring architectures can be created to mimic the physical network allowing efficient utilization of the monitoring device’s ports permitting high-density, logically clustered groups of protected SIPR drops. This allows multiple offices or workstations to be protected by a single alarm system port rather than each office or workstation requiring its own port. Use of this architecture enables many dozens of end-user drops to be protected by one alarm device. This results in cost reductions of 75% or greater per drop when compared to legacy protection methods. In lieu of spending hundreds of thousands of dollars to encase conduit runs in concrete, INTERCEPTOR can protect those same links for a fraction of the cost. Multi-port INTERCEPTORs can protect up to four separate cable runs (even more through point-to-multipoint design) or remain available for deployment to protect future SIPRNet requirements as they occur – with no additional cost or delay. INTERCEPTOR also alleviates the requirement of locked or alarmed manholes that are typically required even when concrete encasement is not required. One INTERCEPTOR unit can monitor both inside-LAN and OSP links. 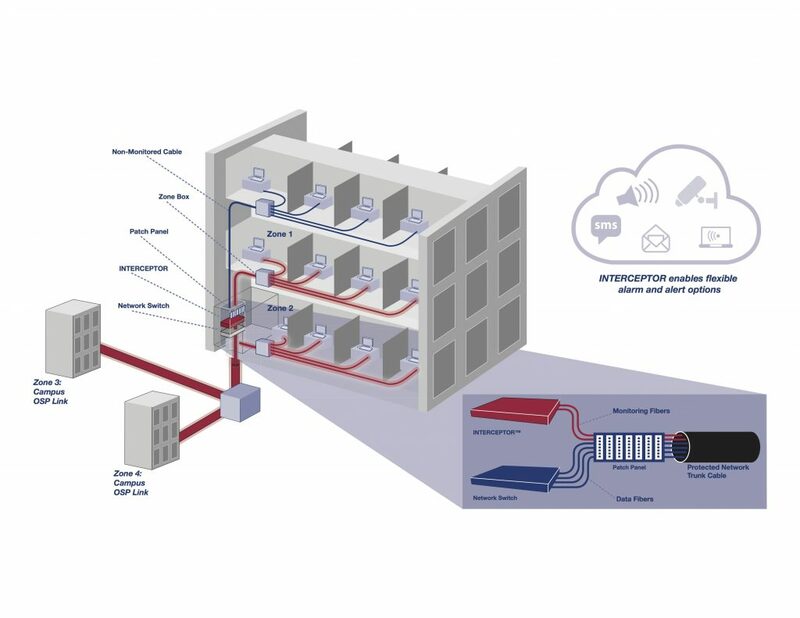 Passive Optical Networks (PON) provides high-speed, high-bandwidth and secure voice, video and data service delivery over a combined fiber network. Since a typical PON is a combination of the entire aforementioned INTERCEPOTR applications, INTERCEPTOR is perfectly suited for deployment within a PON to meet CNSSI 7003 requirements, and is the easiest and most cost-effective solution available to secure and protect critical network infrastructure used for PON transport. INTERCEPTOR CS is a bundled solution consisting of the INTERCEPTOR and an integrated, customized management system called CyberSecure IMS. INTERCEPTOR CS centrally monitors and continually automates inspection and CNSSI 7003 compliant Standard Operating Procedures for response to any threat. It also generates unique case resolution audit trails to simplify Information Assurance Management. With INTERCEPTOR CS, each alarmed zone can be customized to meet the end user requirements specific to that zone. In the event an alarm is triggered, the corresponding data can be shut off using an ancillary device, the StopLight™ Optical Interface. 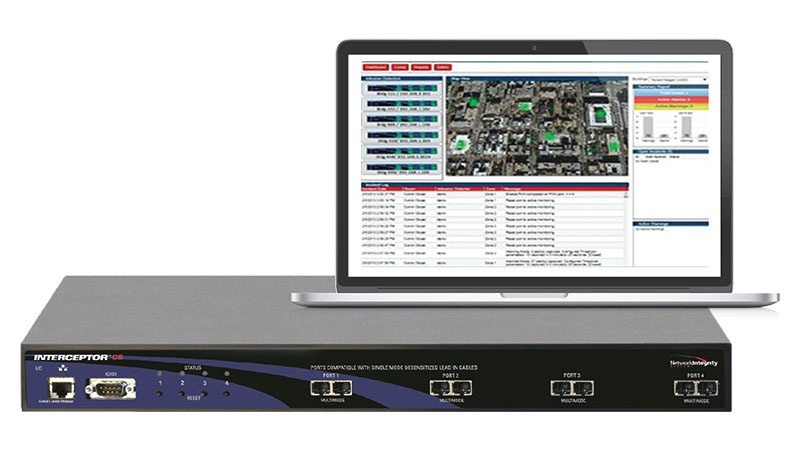 INTERCEPTOR CS allows alarm notification transmission over unclassified networks by incorporating the optional Cross-Domain Communications Unit, enabling an organization to receive notifications of alarms at any time from anywhere. Additional information can be found in our INTERCEPTOR CS Brochure. Watch now to see how INTERCEPTOR CS is ensuring organizations pass CCRI’s the first time, every time! INTERCEPTOR CS is the industry’s first infrastructure protection system capable of eliminating nuisance alarms.